Myriam’s Dress. A collection of treasures woven together through the artistic talent, love and passion. An artistic story of a life that was taken too soon, this has created a whirlwind of artistic spark within the realms of family, friends and members of Montreal Group, Native Immigrants. Myriam’s Dress: Immigrant Grief, Native Condolence is the creation of dressmaker and artist, Carolina Echeverria. After the loss of her dear friend, Myriam, Echeverria decided to use her artistic dressmaking skills to create a “dress” from a collection of donated objects which carried meaning for the people who donated them. 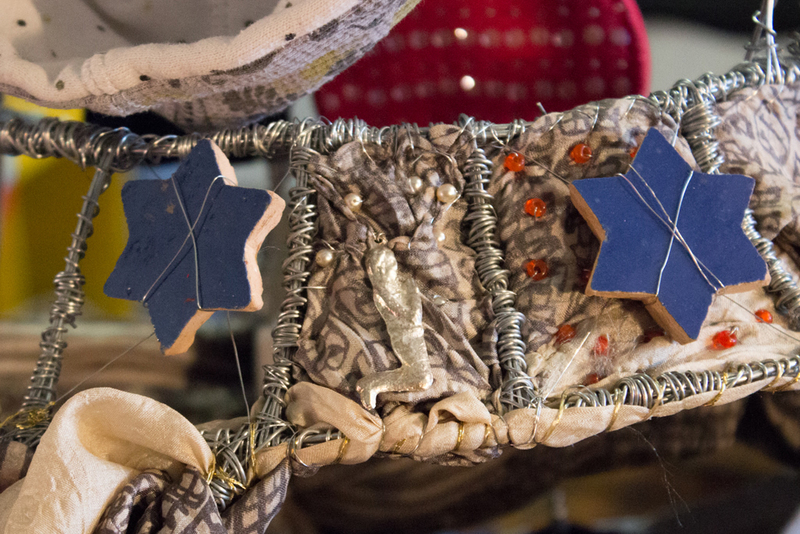 Beads, fabrics, jewels, hats and all kinds of materials which held stories and captured moments spent with Myriam were used to create this symbolic dress. Sewn together with a thread, the thread and dress represents the life of Myriam and her story. This is a story for an Arabic-Jewish family who lost a loved one and receive condolences from a First Nations Elder, and the Native Immigrants group. After the creation of Myriam’s Dress, artists and creators, Susan Scott, Janet Lumb, Judith Brisson, Isabella Echeverria, Emilie Monnet, Saulo Cruz de Oliveira and Amrita Choudhury created art projects inspired by Echeverria’s piece. A place where Myriam’s life could be dearly celebrated in all forms of artistic medium. Last night close family and friends had the opportunity to see these wonderful creations. And I feel so fortunate to have been a part of this celebration of Myriam’s life and witness both the talent and love which has been poured into this project. Speaking with Carolina Echeverria, I realised just how incredible this lady must have been. And even more so, I realised the great beauty in this kind of native and artist grieving. Truly magical. “Myriam was a dear friend to me, she represents the future of this country, the children of immigrants falling in love in this amazing playground called Montreal. They fall in love, they cross their roots and beautiful children come out, erasing past hatred, past wars and new stories are written.” Echeverria said. With a strong connection to the Mohawks, the native people of this land, this experience has taught Echeverria, and others, about grieving. All respects were paid to the land, the native people, and the new immigrants alike. This evening was an experience like none other. A true celebration to Myriam, life and immigrant life here in Montreal. Myriam’s Dress: Immigrant Grief, Native Condolence can be see from December 5 to 13 at Cafe L’Artère, 7000 Ave du Parc (corner Jean-Talon). Monday 10 – 4pm, Tuesday to Friday 10 – 7pm. Items may still be donated and added to Myriam’s Dress.